This is just what I was looking for! I juiced some muscat grapes my neighbor gave me this summer (I was up to my elbows in tomatoes at the time lol) Did the 7 cups of sugar make the jelly to sweet? I have never tried these grapes before and I agree they are AMAZING!! It _is_ very sweet. Maybe cut back on the sugar? Boy, I miss those grapes! We get them in April around here. Hi Donna, would you tell me if Muscat grapes are supposed to be very mushy in the center? I am enjoying them as a snack but my husband was turned off by the crisp outer and almost 'liquidy' inside. They are delish but are they bad if mushy like this? Thank you!! 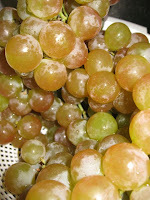 Hi, AAA, I remember them being very juicy with firm skins, maybe only a little softer than the usual red grapes we get. I don't recall them being very liquidy. However, I do know lots of people who like their grapes on the squishier side. If they don't taste fermented, they are likely ok. Thanks for this post! My great uncles arrived from the California central valley with two lugs (produce boxes) of muscat grapes from their homestead. We are watching them soften and deteriorate in freshness over only two days. Today is my day to preserve them....I so appreciate this share! I'll let you know how our jelly turns out. 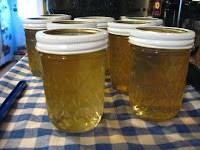 I'll be reducing the sugar, as our family likes some tartness to their preserves. You can also make juice and just save it in that form (can or freeze) if you feel that you can't get to it all that quickly - I'm sure it'd be quite tasty to drink with or without sugar. I planted 3 Muscat grape vines 2 or 3 years ago. This year we have an abundance of grapes so I was wanting to try your recipe. 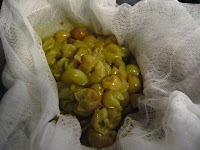 I was wondering if after the cook with 1/2 c water if I could put the mix through a juicer or if that is too hard of an extraction method for these grapes? Also, has anyone had any luck with reducing the sugar? I thought there was a strict sugar to juice ratio that needed to be used to keep the jelly "safe" on the shelf?? I haven't ever tried a juicer but my concern would be more solids in your juice than with the jelly bag or cheesecloth method. I did use the grape screw attachment for the food mill once and that worked pretty well. And maybe try the low sugar pectin?